Hey everyone. It is September and that is mind-boggling to me. And also exciting because I like September, being the Libra, sapphire wearing girl that I am. Something else mind-boggling AND exciting is one of my vacation finds. (See how I transitioned there? So awkward and great. Yeah.) 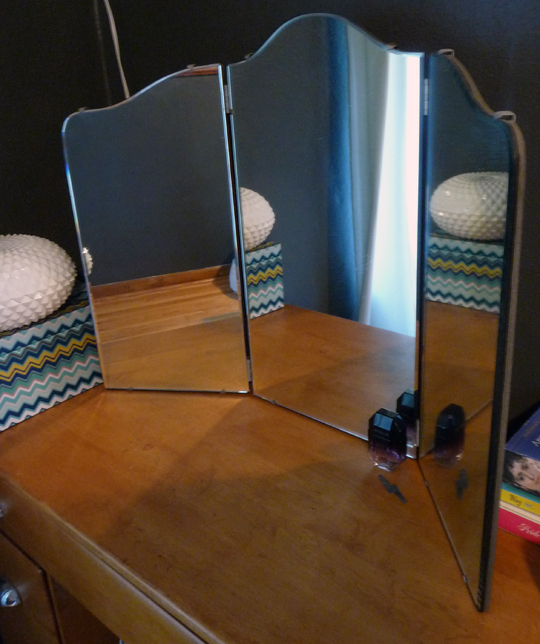 At any rate, back in July I was dreaming of many things and one of them was a vintage tri-fold vanity mirror. At the beginning of our week off from work, I grabbed JT and towed him along with me to the Green Shag Market. 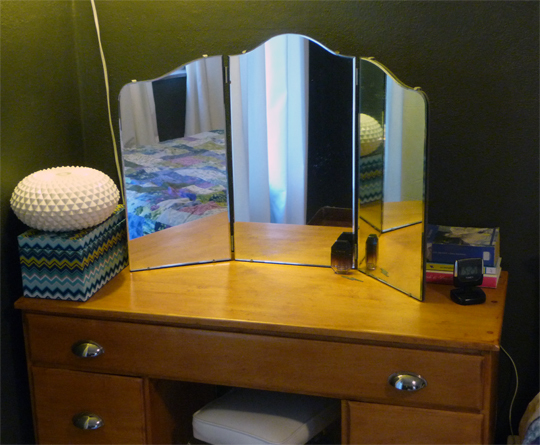 There in one of the corner booths almost immediately upon entering was my vintage tri-fold vanity mirror. And the price tag said (only) $22! Something about the crazy light in my eyes or the way I clutched at the mirror tipped JT off to the fact that I intended to purchase this thing, stat. He immediately carried it up to the front desk so I could finish making my rounds. There were a few other things that caught my eye but in the end we only left with the mirror. Once I showed JT my now-prophetic post with such a similar image of a tri-fold mirror did he understand the insanity he had just been witness to. 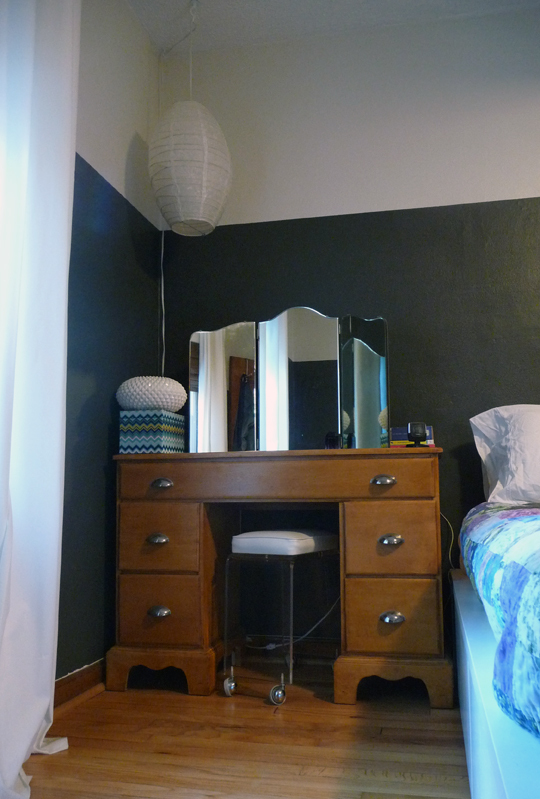 And now it’s home, living on my dressing table in our bedroom. I had this paper lantern light fixture hanging out in the basement of shame. I’m pretty sure I bought it at Pier One in high school to decorate my peach, pink, green and teal awesomeness of a bedroom. Still need to hem those curtains though! Also I’ll probably work on getting the cord rigged up a little better and probably painting the part that shows up against the grey wall. Methinks I need a cuter alarm clock — any ideas? The little lightning bolt on the desk I found on the ground in front of the Green Shag on my first visit there. Since then I have found one other random lightening bolt in the parking lot on my way to work (it’s red vinyl). I think they keep showing up like little love letters from Elvis, king of TCB and lightening bolts. This entry was posted in In the Bedroom, Thrifting. Bookmark the permalink. Find yourself a Panasonic RC-1091. They’re my absolute favorite modern alarm clock and can be bought relatively cheap.